Trauma to the spine can occur for many different reasons, whether it's a car accident, rough sports, or even being shot. The injuries caused by these situations can vary from mild pain to paralysis. There are many different kinds of trauma that can arise in the back, including dislocations, disc herniations, whiplash, and fractures. Dislocations: This can occur when there is not longer contact between joint surfaces. This type of injury can be very painful and is considered to be dangerous due to the possibility of spinal cord damage. Disc Herniations: Between the vertebrae of the spine are discs, which act as shock absorbers. When an accident causes the nucleus of the disc to rupture, pushing material out of the nucleus, it's called a disc herniation. 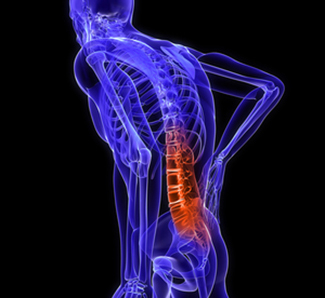 Herniated discs can be very painful and can cause nerve damage. Whiplash: When the weight of the head surpasses the ability of the neck to control its motion, whiplash occurs. This tends to happen in intense situations like car accidents that cause the head to jerk back and forth. Whiplash can cause the neck's vertebral discs to bulge, tear, or even rupture. Fractures: During an accident or rough situation, bones can be broken. There are several different types of fractures. Compression fractures are the most common to affect the lower back, and they usually are caused by a fall. Burst fractures occur when pressure is exerted vertically on the spine, and they require stabilization of the body and immediate medical attention. Flexion/distraction fractures are often caused by seat belts and are considered unstable. They require medical attention and stabilization. Flexion/compression fractures usually occur at the start of the thoracic and lumbar sections of the spine. There is some loss of height associated with this type of fracture, but it is generally considered stable. Compression/torsion/translational fractures are often the result of multiple forces and can affect bones, ligaments and discs. Symptoms vary depending on the type of injury and its location on the back. Physicians will identify the problem through a physical exam, followed by the use of diagnostic tools like X-rays, MRIs, or CT scans. Symptoms of trauma to the spine vary depending on the type and extent of the injury, but can include pain, weakness or numbness, increased muscle tone, and bowel and bladder problems. Treatment depends on the type of injury, but most injuries due to trauma need immediate medical attention to avoid complications in the long run. Treatment varies with each type of injury, but often bed rest and medication will be needed. Once the injury has begun healing, physical therapy may be recommended. For severe injuries, surgery may be required.